Broomfield, CO (January 7, 2018) – Sheltair, one of the nation’s leading aviation services companies, announced Craig Foster as its new General Manager for their full service FBO and hangar complex at Rocky Mountain Metropolitan Airport(KBJC). Mr. Foster will be responsible for Sheltair’s first corporate presence west of the Mississippi, underscoring the company’s strategic decision to meet the needs of a growing and dynamic general aviation community in that part of the country. Foster joins the Sheltair team with more than twenty years of FBO management experience, playing crucial roles in FBO startups, negotiating airport leases, new facility development, and charter and maintenance operations. He began his career with a start up FBO at John Wayne Airport in Orange County, CA (KSNA) before moving to a management position. After it was acquired in 2005, Foster was named Regional Director overseeing Orange County and Palms Springs FBOs for Atlantic Aviation. Prior to joining Sheltair Aviation, he was the President of Jet Source (KCRQ). Foster holds his private pilot’s license along with an instrument rating. He also served as the recent past President of the Southern California Aviation Association. Foster holds a B.A. in Business Administration from Walla Walla University in Washington State. He currently resides in Denver, CO.
Sheltair, a privately-owned aviation development company, operates award winning FBOs and manages almost four million square feet of aviation related properties throughout Florida, Georgia, New York and Colorado. Sheltair services include fueling, VIP handling, ground handling, crew and passenger amenities, hangar and office leasing, and turnkey design and build of aviation properties. Sheltair is currently engaged in a series of new hangar construction projects designed to meet the 21st-Century demands of business aviation and the new generation of aircraft. For more information about our FBOs and development projects, visit www.sheltairaviation.com. FAA Reauthorization is a hot topic at this time, and the bill prepared has two great features that allow NBAA to offer it strong support. One great aspect is its 5 year duration, giving us a period of time that we can enjoy relief from many ongoing budgetary challenges. The other, greater feature is actually something that the bill does not have, which is ATC privatization. We - all of us in business aviation - have stood up together to make sure that privatizing air traffic control would not move forward, ensuring that access and representation of our sector remains unharmed. Thank you all, and I hope you all feel a sense of pride in that accomplishment. Santa Monica Airport is an ongoing battle of which we remain dedicated to a front line role. The reality is that the airport is not scheduled to close as many say, but only that its federal obligations end in 2028; there are no firm plans to close the airfield at this time. NBAA will remain actively involved to represent the aviation community in hopes of allowing Santa Monica Airport to serve their great city with the economic and public safety contributions that it delivers. Workforce challenges remain the biggest obstacle facing our industry today. All roles in aviation are aching for more personnel in the roles of pilots, mechanics, instructors, operations/dispatch and more. NBAA has developed great initiatives with scholarships, mentorships and internships that will empower those who are either already stepping into aviation but could still use some coaxing into the corporate/business sector, or to inspire others from outside of the industry as we aim to widen the pipeline of entrants. Specifically in the Western Region, the forming of regular events to interact with young people of all ages, in addition to veteran outreach, are actively under construction or underway. Though we can facilitate these forward steps, none of it can be done without everyone’s help. We need all hands on deck, offering a variety of resources to build up local inventory of scholarships, mentorships and internships so that the young people that in our schools today can be on your aircraft and in your airports, and offices tomorrow. To learn more, volunteer on workforce initiatives, or for any assistance as an NBAA member, please email Phil Derner at pderner@nbaa.org. Through a creative joint effort, east coast’s Liftoff Learning and west coast’s I Hart Flying Foundation team up to offer flight scholarships over a 6-week themed ‘scholarship showdown’ social media campaign. With the lack of qualified pilots looming over the aviation industry, both organizations, founded on the mission to advance youth in aviation and flight training, refused to sit by and not act. Liftoff Learning and I Hart Flying realized breaking down silos and working together is one of many ways to partner and grow talent of diverse aviation and STEM (science, technology, engineering and mathematics) professionals. “I was given the gift of flight in 2010 which steered my passion for aviation,” shared Rachelle, founder of I Hart Flying, based near Pasadena, Ca. I Hart Flying - especially given March is Women’s History Month and having celebrated International Women’s Day on March 8 – aims to offer more access to young women who wish to fly, have the dream of becoming a pilot, yet resources are limited. Rachelle is an accomplished aviator who currently holds a commercial single-pilot jet type rating, having flown general aviation, corporate and military aircraft, warbirds, and rotorcraft. With philanthropy at her core, “Now I have a chance to pay it forward for more young women to explore the joy of flying with fellow partners, donors and aviation enthusiasts joining our efforts!” Rachelle already completed outreach events and secured several key partners across the industry such as the Experimental Aviation Association (EAA), Bose Corporation, JetAviva, Base Turn and Aviation Life clothing. “We are excited at the opportunity to bring the gift of flight to young people who may otherwise find pursuing a pilot's license an unattainable goal,” expressed Liftoff Learning’s founders. “Through this scholarship, we hope to inspire a diverse group of aspiring aviators to follow their passion. By documenting and sharing the journey to becoming a certificated Private Pilot we hope to help more than just this year's scholarship winner gain their wings.” This growing organization, based near Richmond, Va., uses mixed-media, interactive, hands-on personalized experiences to attract youth into STEM and aviation programs. Today marks the official launch date for these two high-energy aviation organizations to excite youth, provide financial opportunities for young people through scholarships, allowing them to realize their dream of flight. Each organization have set scholarship criteria and application details, made available on their websites. It’s expected final recipients will be selected in April or May 2018, with flight training to follow shortly after the scholars are announced publically. I Hart Flying is a 501(c) 3 non-profit organization founded by Rachelle - a talented pilot, fascinating speaker, social media personality and entrepreneur who excels at delivering impact, inspiration and influence for current and future female pilots. I Hart Flying’s mission is to assist young women in achieving their aviation goals through the awarding of flight training scholarships. They believe that helping young women achieve their pilot's license will provide a positive way to increase the number of women aviators. Partnered with the Experimental Aircraft Association (EAA), I Hart Flying’s goal is to provide five $5,000 flight scholarships annually to young women. For more information about I Hart Flying, visit iHartFlying.org. Liftoff Learning is a 501(c)(3) nonprofit organization that provides students, educators, and local communities with the tools and resources to pursue STEM careers through mentorship and educational enrichment programs in the foundational concepts of aviation. Through a mixed-media approach to teaching, each student can learn according to their own strengths and personal objectives, this creates a personalized experience for every student. For more information about Liftoff Learning, visit LiftoffLearning.org. 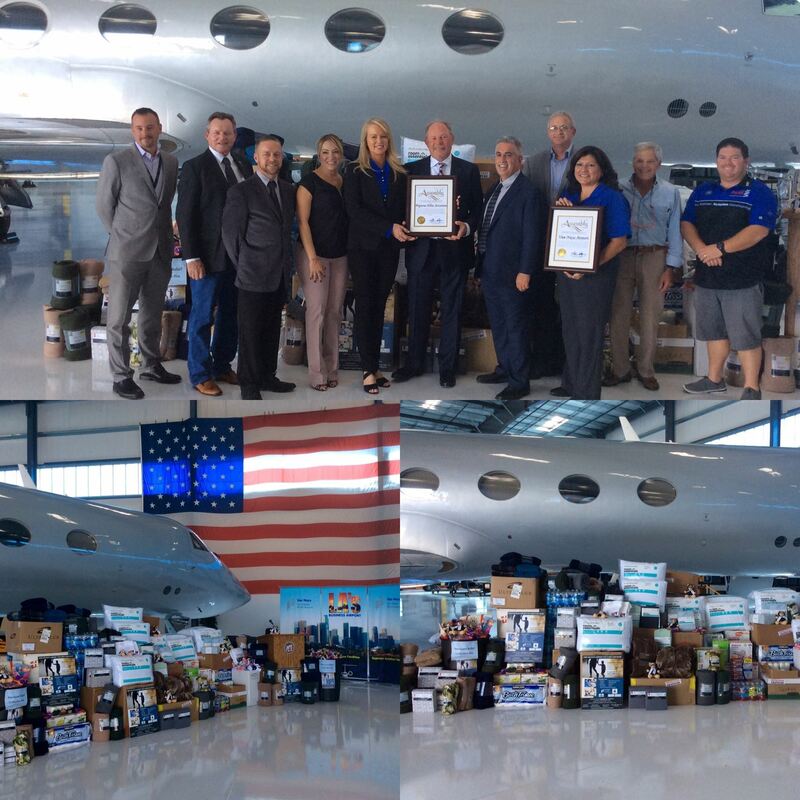 In September, Van Nuys Airport (VNY), Pegasus Elite Aviation, Van Nuys Airport Association and Operation Gratitude held an airport-wide relief drive to benefit victims of hurricane-affected areas in Florida, which saw a generous outpouring of donations from the community. The collection drive, which ran from September 26 to October 9, received items desperately needed by the communities in hard-hit areas. More than 8,000 items were collected for Foundation 37, a non-profit group out of Port Orange, Florida, which worked to identify the needs of the affected areas. Donations covered a wide variety of essential items, water, and more than 1,000 articles of clothing. Drop-off locations were stationed throughout the airport, including Aeroplex/Aerolease Group, The Park VNY, Signature Flight Support and VNY Administration. On October 24, the donations were loaded onto an aircraft donated by Pegasus Elite Aviation and flown to Daytona Beach International Airport, where Foundation 37 coordinated receipt and transport to communities surrounding Port Orange and areas within the Florida Keys. 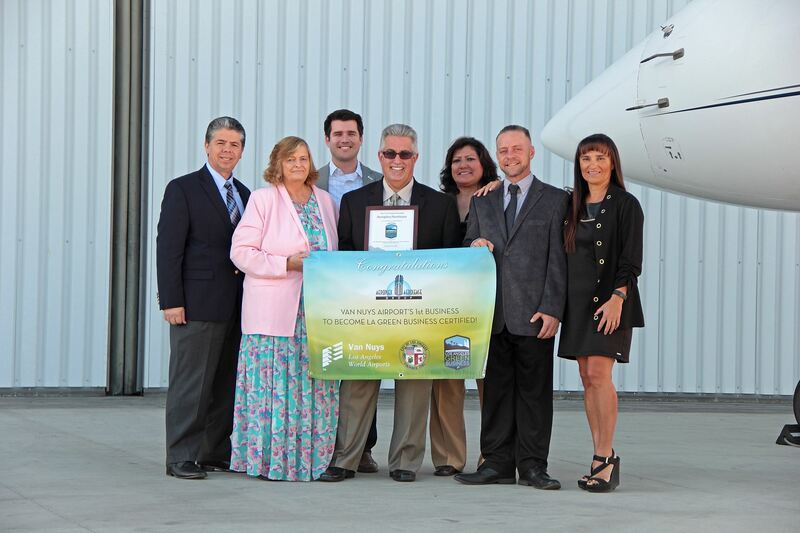 The Aeroplex/Aerolease Group has become the first VNY tenant to be certified in the City of Los Angeles Green Business Program, which provides free assistance to help and encourage L.A. businesses to become more efficient and sustainable. Among several sustainability measures that Aerolease has implemented – including a recycling program and the efficient use and reduction of water consumption – they have become the first business to install a solar power system. With 4,000 roof-mounted solar panels, this new solar electric system will generate approximately 2.5 million kilowatts of electricity and reduce carbon emissions by 4 million pounds annually. These green measures, in combination with others around the airport, seek to drive responsible environmental stewardship and promote a sustainable business. The Green Business Certification Program involves meeting program standards for resource conservancy, minimizing waste and mitigating pollution, in conjunction with environmental law and regulation compliance. The program incentivizes environmental best practices, and each certified business receives a City of Los Angeles Green Business Certificate, listings in promotional partners’ websites, green resource guides and more. For more information on going green with the City of L.A., visit www.greenbizla.org. Shortening of the Santa Monica Airport runway was completed in December. The airport is fully operational with 3,500 ft of runway available for landing and takeoff. Other changes include updated taxiway lights and markings, and new designated turn-offs and taxiways for access to and from the ramps. In this thriving economy, demand for highly skilled professional aviation personnel is especially great, leaving our sector of the industry vulnerable to workforce shortages. NBAA’s Business Aviation Management Committee (BAMC) conducted surveys, consulted with member companies, and is working closely with the Domestic Operations Committee and Young Professionals (YoPro) Council to identify and create solutions. A mentoring program to match prospective mentors and mentees is underway https://www.nbaa.org/prodev/mentoring/nbaa-launching-new-business-aviation-mentoring-program.php; and staff is reviewing NBAA’s Business Aviation Management Guide to edit and enhance sections addressing workforce development. SCAA’s leadership in the area of scholarship and mentoring is appreciated. See the January/February issue of Business Aviation Insider magazine for more information about how to keep valued employees and expand your company’s talent base https://www.nbaa.org/news/insider/archives/. In recent months, residents surrounding San Carlos Airport (SQL) lobbied San Mateo County supervisors to reduce noise and overflights at SQL. In response, NBAA, local pilots and Surf Air who provides subscribers with multiple daily flights into SQL collaborated with FAA Air Traffic Services to approve the Bay Area Visual Approach. Currently, the approach is available only to authorized users, but could be published and ready for general use later this year. The new approach reduces the impacts of overflights in many of the most sensitive areas near of the County. The Association of California Airports recently surveyed airports around the state to determine how general aviation airports were used to conduct fire-fighting and emergency relief activities during the recent wildfires and flooding. Survey results will help CalTrans officials and State Legislators understand the value of community airports for both the quality of life and positive economic impact they provide to local citizens during Aviation and Aerospace Days at the Capitol in Sacramento, March 12-14, 2018. This is an important reminder that despite the 2018 year-end retirement announced by Transportation and Infrastructure Chairman Shuster, privatization of the national airspace still tops the list of legacy legislation Shuster hopes to pass in 2018. We thank SCAA members for all you have done to defeat this industry threat. Your calls and written messages helped keep HR2997 from getting to the House floor for a vote in 2017. Please, keep communicating with congress! Especially to conservative members. Even if you called in the past, keep this number handy and remember to contact Congress at 833-GA-VOICE. Peter Drinkwater retired December 31st from the County of San Diego as our Airports Director and the County has hired a third Operations Coordinator for Palomar Airport and his name is Haval Bedihi. Starting June 1, Hawaiian Airlines will offer daily, non-stop service to Honolulu (HNL) from Long Beach Airport (LGB). Hawaiian Airlines plans to fly the route with one of its new Airbus A321neo aircraft. This aircraft represents the latest in engine technology and is among the quietest and most efficient aircraft currently flying. Through November, Long Beach Airport continued to show strong passenger numbers in 2017, and reported a nearly 24 percent increase in November 2017 compared with the same period in 2016. In November 2017, LGB served 321,152 passengers compared to 259,805 in November 2016. Runway 25L at Long Beach Airport will close for reconstruction, starting the week of January 8, 2018. General Aviation aircraft that typically use this runway will be diverted to 25R, the airport’s secondary runway, and occasionally Runway 12-30, the airport’s main runway. The FAA Air Traffic Control Tower will direct the displaced flights at their discretion. Runway 25L is anticipated to reopen by the end of July 2018, pending any construction delays. Following the reopening, 25R will close for approximately one month for construction of blast pads which will help stabilize the ground from jet blasts. Minimal flight displacement is expected. NBAA continues to track the path of what's left of Hurricane Harvey, which has caused tremendous damage along the southern coast of the U.S. As with previous natural disasters, the business aviation community is poised to support relief efforts as the flood waters recede. To help in this endeavor, NBAA offers the following resources to ensure safe operations and help coordinate member efforts. NBAA’s Air Traffic Services at the FAA ATC System Command Center has been providing regular updates about the status of airspace restrictions and airport closures in areas affected by Harvey. Operators should ensure a full review of NOTAMS for airports in these areas as airport conditions are changing quickly. Also, operators call ahead to confirm needed services are available, regardless of airport status. Developed in the aftermath of the Haiti earthquake in 2010, the NBAA Humanitarian Emergency Response Operator (HERO) Database collects information about aircraft and individual volunteers that can be shared with relief organizations in the wake of natural disasters. Registering does not commit you to provide aid and you always have the ability to pass on a mission request. If you registered with the NBAA HERO database before July 2017, please register again now to make sure NBAA has up-to-date information. If you take part in relief effort, please share your story with NBAA. This information about conditions on the ground can be extremely helpful to relief organizations and to other aircraft operators starting their own relief flights. Email NBAA’s Dan Hubbard at dhubbard@nbaa.org. Thanks to those in our community who have already contributed to Harvey relief efforts and thanks in advance to others who will step up in the weeks and months ahead. To mentor, educate, and encourage young people to become involved in and deeply engaged with our industry. In 2016, the SCAA demonstrated this commitment by making a series of valuable donations to several key organizations. Towards the end of the year, SCAA donated $1,500 to The Santa Monica Airport Association, with an eye toward assisting them in efforts to keep the airport open. SCAA has also donated to Lyon Air Museum in Orange Count – and joined forces with them to assist in their valuable education program. In 2012, a partnership in education was established between the Lyon Air Museum and Newport Mesa Unified School District, via a program entitled “The Greatest Generation – A WWII Field Trip Experience.” As part of the District’s curriculum, students are led through several Museum exhibits by knowledgeable docents, with stops at distinct sectors that are staffed by World War II veterans. At these educational and emotional stops, students are given an opportunity to meet the veterans, hear their stories and ask questions. Firsthand accounts given by the veterans include topics such as the Attack on Pearl Harbor, D-Day Invasion, Strategic Bombing Missions over Germany, and Life as a Prisoner-of-War. In addition, many of the veterans distribute personal “collector” cards – much like baseball cards – featuring their biographical information, military service pictures, service awards received, and interesting tidbits about their time in service. The positive feedback this program has received from teachers and students alike is phenomenal. In 2017, the program enters its seventh successful year, and is anticipated to impact approximately 30 schools and more than 60 sixth-grade classes. In addition to its donations to the Orange County Lyon Air Museum and the Santa Monica Aviation Association, SCAA has given nearly $400,000 to various organizations over the past seven years. In 2016 alone, SCAA awarded more than $8,000 in donations, $7,000 in scholarships and $75,000 in training awards. Established in 2006 and headquartered in Carlsbad, CA, Southern California Aviation Association (SCAA) focuses on safety, mentoring, career development and networking in the aviation industry. The stated mission of SCAA is to advance and promote aviation-related business throughout Southern California; to be proactive in addressing concerns impacting the region’s airports, including safety and operations; and to promote education on the importance of business aviation to Southern California communities, companies and the general public. SCAA membership is comprised of corporate, service sector and non-profit entities, as well as individuals with a strictly aviation focus. As part of its mission to promote and grow the aviation industry, SCAA also awards multiple scholarships and awards each year. You can learn more online at www.socalaviation.org.